2012 boasted many new partnerships for Rapson-Inc. If you are traveling in any of these cities, search out these stores; They are wonderful for experiencing fun and exciting design in person, and are also invariably located in the cities’ cultural hotspot. Forage modern workshop in Minneapolis who provide customers, with not just handsome furniture, but are also an “idea shop,” a place for new design--especially from the midwest. This mobile is available from their online store (I have a love for mobiles nurtured by growing up around Ralph’s collection). ModLivin in Denver features a large showroom of furniture and a fun selection of furniture both new and classic. If you act fast they also have a supply of Stendig iconic wall calendars (baby not included). Mid2Mod in dallas sells the best new and vintage furniture, lighting and household accessories. If you are shopping in Texas, this is the place to do it. As a case in point, they are the only retailer of Bend designs (cool table below) in the South US and the only dealer for Rapson in Texas. One of the most recent additions to our showrooms is Markanto in Germany. Yes you read that right, Rapson furniture is now available overseas. Markanto has an exhaustive list of furniture by nearly every modern designer. If you are looking for furniture in Germany, you have found it. Boomerang for Modern in San Diego has been ‘bringing back’ good design since 1985. Located in the Little Italy district, they have three floors of stunning new and vintage furniture. In addition to a blog featuring new furniture finds, their website also has a great section of interior design projects they have consulted on (including one at the ubiquitous Stahl house). Wojo Works in Spokane Washington is a spunky furniture and gifts store. They specialize in selling not just classy designs, but classy designs with personality. Their fun sense of humor comes through quickly browsing their online store. One of the most exciting exhibitions we were able to do this year was at new retailer Two Jakes in New York City. The show in May featured many of Ralph’s drawing’s and also featured the introduction of the Rapson Line of Outdoor furniture with Loll Designs. 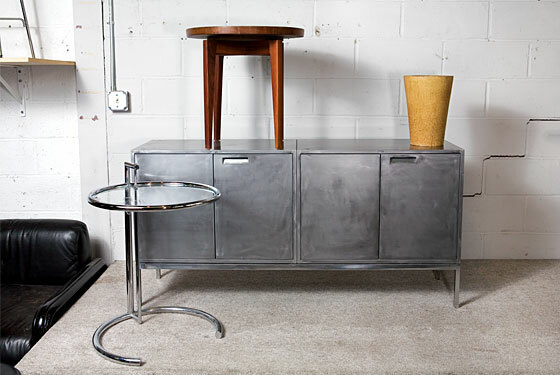 Two Jakes’ great showroom (best of NY according to New York Magazine) can be found in Williamsburg, Brooklyn. If you are in the Big Apple stop by and tell them Rapson-Inc. sent ya!